Ask someone who knows a little about WWII aircraft what was the most important German plane of WWII and they will probably say the Me-109. They'd be right as, like the Spitfire, it was in production from day one until the end. 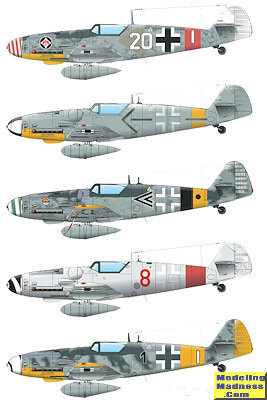 As with all long-lived aircraft, the airframe was constantly modified until the last of the 109 series held little that was interchangeable with the first. By far, the greatest number of 109s produced was the G series and the most produced of the G series was the G-6. This variant was built for around two years (a very long time in the early/mid 1940s) but was modified as time went on and the situation changed. Not surprisingly, many of the late war Luftwaffe aces flew this version at some time during their career. Last year, after a lot of anticipation and an equal amount of hype, Eduard released what was to be the best 1/48 Bf-109 every kitted. To quote a line from 'The Right Stuff', they screwed the pooch. It turned out that the aircraft was not 1/48 scale with parts of it in different scales. It built nicely, but when one promises the world and then doesn't deliver, it causes much anguish amongst the faithful. How the situation came to be doesn't matter, only that it happened. To Eduard's credit, they did not just say 'oh well' and continue cranking out different variations on that flawed kit. Instead, I've been led to believe that they completely retooled the kit to eradicate the flaws and give those who are so passionate about their 109s a proper kit. This is the result of that. One first notices that there are a lot of parts. Eduard is one of those companies who basically runs a myriad of variants from a basic tooling. It is the smart way to do kits in today's market, especially a subject like the 109 which was built in a bewildering number of sub-variations through its production life. None more varied that the 109G. 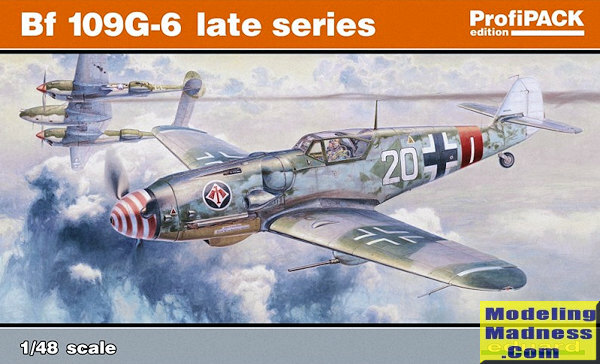 This kit is touted as a 'late' version and what that means to most modelers is that all the markings options are for aircraft that use the Erla designed canopy which were first fitted to the 109 in early 1944. In fact, there are three of these Erla canopies of which two are for this boxing. The standard canopy is also provided along with four windscreens. Other multiples are fins and rudders with three tall and one standard rudder. You'll have quite a few spare bits that you can use on other kits. You also have three props, two sets of tires, three types of drop tank, two oil coolers, several supercharger intakes, several head armor pieces, two upper cowling sections, optional nose gun covers and so on. The real 109 fan could probably build pretty much any 109G variant as even spoked wheels are included. The molding is what you'd expect from Eduard and since this is the Profipack version, you get a bunch of markings options, a set of canopy masks and a color photo etch fret. This fret includes belts, instruments, radiator screens, exhaust shield, rudder pedals, and a number of other smaller bits. Most if not all these bits are also provided in plastic as without them Eduard couldn't do a Weekend Edition later on. The cockpit is nicely done and one will have to do some cutting and drilling to use all the etched bits. All the control surfaces are separate bits, including the flaps and slats and radiator exhaust flaps. For things on the underside, you have a drop tank and the option of the lower wing cannon if you choose that particular option. Instructions are quite comprehensive and provide detailed information on what bits to use, what holes to open, what areas to fill and so on depending on the markings option you are modeling. This means that you'll need to make that decision rather early. Three of the five options are in the standard RLM 74/75/76 scheme, one is in RLM 75 over 76 with a white fuselage and the other is in an overall RLM 76 scheme. 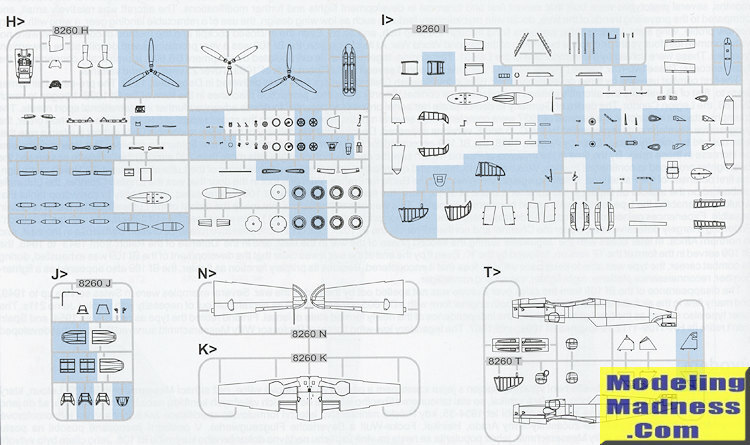 What this all boils down to is that 109 modelers now have a modern, detailed kit of their favorite aircraft and can look forward to more from the same. I have to add in that I'm not sure if Eduard retooled everything or just the fuselage and wings but those I've asked have said it was a completely new tooling. 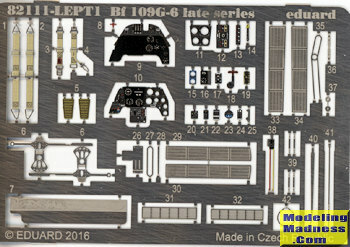 Those of you with the earlier kit, can look at the parts diagram and probably tell better than I. I should add that as nice as this kit is, there is no reason to chuck your other kits. If you should decide to do that, I'll give you my address and you can throw them away in my direction. I'll pay postage.